A point to prove, to prove that he is the best player on planet earth, determined to regain the top spot on the Men’s World Rankings, Ma Long won the Men’s Singles title at the Seamaster 2018 ITTF World Tour Platinum German Open in Bremen on the afternoon of Sunday 25th March. The first three games were all decided by the minimal two point margin; the third being totally different to the first two when neither player had been able to gain a clear lead. Ma Long established a 10-4 lead, Xu Xin won the next four points, understandably Ma Long called “Time Out”; Xu Xin saved one more game point but he could not make it six in a row; the advantage was with Ma Long. In the fourth game Xu Xin gained an early lead, Ma Long levelled at 8-all before winning the next two points; one game point was saved not a second. Ma Long held a three games to one lead, it was the pivotal stage of the match, now more confident, Ma Long went ahead 4-1 in the fifth game, Xu Xin called “Time Out” but it was to no avail, the gap remained, Ma Long never relaxed the grip, the title was secured. 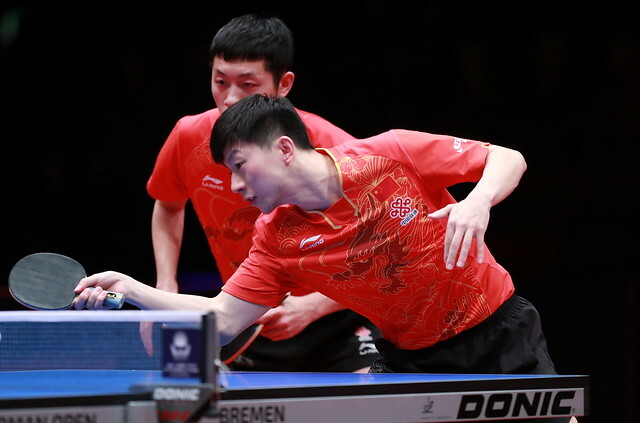 Success for Ma Long means that since the German Open joined the ITTF World Tour in 1999 when the tournament was also staged in Bremen, he has won the Men’s Singles event more than any other player. Prior to play commencing in Bremen he had won four times, the same as the host nation’s Timo Boll; the German having emerged successful in 2004 in Leipzig, before succeeding in Bayreuth in 2006, Berlin in 2008 and the following year, when as today the tournament was staged in Bremen. Additionally, he had been the runner up in 2011 in Dortmund, 2012 in Bremen and 2017 in Magdeburg. Meanwhile, after losing in the final to Vladimir Samsonov of Belarus in Magdeburg in 2007 when only 17 years old; in 2010 and 2016, Ma Long succeeded in Berlin; in 2007 and 2015 he won in Bremen, seemingly his favourite German city. Bremen was also the home for the Liebherr 2006 World Team Championships when Ma Long was on his World Championships debut. Overall for Ma Long it was his 25th ITTF World Tour Men’s Singles title; he closes the gap on Vladimir Samsonov of Belarus who has 27 such titles to his credit plus one Challenge Series. Conversely for Xu Xin it was his first ever ITTF World Tour Men’s Singles final in Germany; overall now he has appeared in 21 such finals and finished in runners up spot nine times.